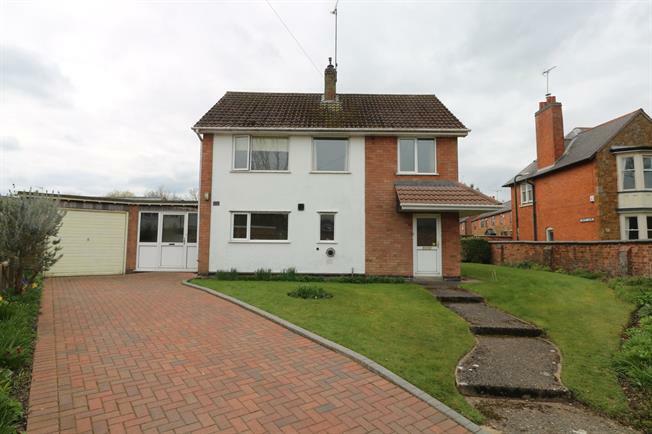 3 Bedroom Detached For Sale in Leicester for Guide Price £350,000. Although some modernisation of the property is required there is fantastic potential for any prospective buyers to put their own stamp on the home. On the ground floor there is a spacious living room/dining space, fitted kitchen with useful pantry cupboard off as well as the extended garden room. The large windows allow plenty of natural light especially as the rear of the property is South facing. To the first floor there are two double bedrooms and a further single bedroom all of which have built-in storage/wardrobe space. Also on the first floor is a generous bathroom that although may require a refit does currently have a four piece suite to include a separate shower space with mains shower, panelled bath, low flush WC and wash hand basin. To the outside the gardens wrap around three sides of the property. The front is largely laid to lawn and enclosed by a mix of red brick wall and picket fencing. There is a block paved driveway that provides off road parking for three vehicles as well as direct car access to the garage. To the side and rear are gardens that are laid to lawn with planted beds. French doors from the garden room lead out to a paved patio seating area and the garden is completed by a vegetable plot.